I remember watching Rick Stein's French Odyssey years ago and he visited Toulouse, home of the fine sausage. For some reason I'd always thought of it as being something heavily seasoned, something that would linger on the breath, but he spoke of a lightly cured sausage with nothing more than pepper seasoning it in some instances, other makers adding a splash of wine or some nutmeg. The more I read about the classic sausages of the world the more I find that are just the same, a couple of simple seasonings that let the pork shine through. Back to Rick Stein not too long after the series I ended up in Padstein, being treated to a culinary feast of a weekend by my girlfriend, the finest 30th birthday present a food-obsessed man could dream of: a day on his seafood cooking course, meals in his seafood restaurant and his bistro not to mention breakfasts in his cafe (and sleeping in his B&B above - obviously) and a little RS fish and chips too. When the menu at the bistro displayed the 'Toulouse Sausage with Tomato, Red Onion and Caper Salad' I'd seen on the aforementioned show I had to order it, my mind drifting back to the huge coil of sausage he'd lopped a few inches off and placed on the sweet and tangy salad. The dainty three slices of tomato with a few thin slices of sausage scattered on top couldn't have been further from the hearty meal I'd seen on TV in quantity but - for the three mouthfuls I got - the flavour was very good. As you may have noticed I've dragged the sausage maker out the cupboard recently and so decided to get some Toulouse made. They're a sausage I've made before and the home made (and real ones) are nothing like the supermarket attempts, simple and meaty with a bacon taste coming from the addition of cure or some bacon along with the pork. This contrasts starkly with the overly complex smoked bacon, garlic, red wine and rosemary I've seen in some of our stores which also suffer from the addition of filler. Not a bad thing per se but the Toulouse, like most its continental cousins, is filler free and firm. Whilst I enjoyed Rick Stein's recipe the tomatoes over here are bad enough at the best of times, let alone in October. As the nights draw in and the temperature drops do you really want something so light too? Personally I like to start moving towards some heartier dishes and this sausage and potato salad fits the bill nicely, the sharpness of the vinegar dressing acting as a foil to the fattiness of the sausages. Obviously this would work with any sausage, but I think a firm continental one is better for slicing than the softer rusk containing English bangers, standing up better to the bite of the waxy potato. Simmer the potatoes till done and chop into 3cm pieces. Whilst these are cooking simmer the sausages for 10 minutes until cooked through (this sets the shape nicely) then brush with oil and brown under the grill. Chop into 3cm bits. Make the dressing from the oil, vinegar and sugar, seasoning with S&P. Whilst everything is warm toss the potato, sausage, onion, parsley and dressing together. Mince the pork once through the biggest plate. Mix the seasonings into the white wine then distibute through the meat. Stuff, twisting into slightly larger than British banger links then leave in the fridge overnight to dry and allow the cure to do its thing. Alternatively you can leave the sausage in one large ring and cut off sections as needed. To cook either fry, grill, poach or poach and grill, as above. I'm a recent convert to Twitter. I dabbled a bit a couple of years back but it wasn't till I returned from travelling that I got properly stuck in. Even now for the most part people I follow and who follow me are related to food and due to this I know of far more of the food blogisphere than I used to. In most ways this is great but it can lead to a bit of overexposure when a new restaurant opens and folk rush to be the first there and first blogging it. I have to admit it all gets a bit much so I tend to read the first one or two and then any more after that I just open and look at the pictures - sorry. The restaurant I think I've seen the most blog posts about in quick succession is Bar Boulud and whilst the reviews may have made other readers want to eat at the place what they made me want to do was recreate some of their dishes at home, first and foremost the rillons. I'm a huge fan of pork cooked in lard, having cooked and enjoyed rillettes, confit and carnitas. A bath of lard seems to dry the meat out less, allowing you to cook meat for long periods of time whilst keeping it moist. I guess on the French lard-cooked pork scale (if there is such a thing) they sit between rillettes and confit, smaller than the latter but not the mashed to a paste of the former - melt in the mouth chunks of flesh with a light golden exterior (mine are a little overcooked on the bottom) and chewy but ultimately yielding skin. They're versatile too as you can eat them hot or cold, sliced onto bread or sprinkled with salt and eaten whole. I believe you can submerge them in fat and store like you would confit but they're so tasty that I can't see why you wouldn't want to eat them all straight away. Cut the belly into 5cm lumps, leaving nice cubes of skin/fat/meat/fat/meat. Rub with the salt and leave for a few hours. Wash off the salt then place the pork and the remaining ingredients in a saucepan along with 250ml of water. Bring to the boil then turn down to a medium simmer and cook for 2 - 2.5 hours until tender. As with rillettes, well before the time is up the water will have evaporated and they will be simmering in the lard and fat rendered from them. Heat an oven to 200, spread the rillons on a baking tray and cook for 10-15 minutes, keep an eye on them and turn every few minutes till they're evenly coloured. You're only looking for light golden as you don't want to toughen them up. Serve with salt, hot or cold, as part of a spread of charcuterie or on their own. You can either save the lard or dispose of it, probably best to leave till set and stick it in the bin though unless you want to contribute to these fatbergs. Potted meats seem to be popular at the minute as I've seen them on many menus. Over the years I've made a few of them, ranging from rillettes du porc through to hough - the Scottish dish of beef shin set in its own gelatine - and I can say hands down I've enjoyed them all. I'm a self-confessed meat addict, rarely going a meal without any (even my daily breakfast revolves around it - I need my protein) and the idea of spreadable meat - scratch that - rich, fatty, heavily seasoned spreadable meat is right in so many ways. Pair it with some toast and a pickle of some description and your well on the way to an ideal lunch. For the blog I wanted to do something a bit different from your average rillettes, not that a plain rillettes isn't lovely (many a day on the slopes has been sustained with a baguette and tin of rillettes du porc stuffed in the rucksack) but there are hundreds of recipes on the web already. The thought of using ham came to mind as I'd seen potted ham recipes but I didn't want to mince leftover ham and set it with some butter. Not that it isn't tasty - it is so - but I wanted to set off with the sole aim of a potted product, not a dish of leftovers. By using a rillettes recipe every last bit of hammy goodness would end up in the dish, no wayward meat juices lost through boiling or roasting and no requirement for extra fat. Just start with a lump of cured pork and cook it down, stewing it its own rendered fat until all that was left was tender strands of flesh, pink from the cure and moist with lard. I guessed at this point it would want a bit of seasoning, although being cured (and so having spent a few days in salt already) it would mean that I'd only need to turn to black pepper. For the recipe I cured my own piece of pork shoulder because it has a good proportion of fat (key for rillettes) and because the texture has the large striations you need too. This may also work with a piece of gammon as well but I think you'd need to add some extra fat. Everyone should learn how to cure though before it becomes a lost art so I'd suggest buying some cure #1 and cracking on, you can then make your own bacon and salt beef too. When we were in Paris a while ago the restaurant Au Pied de Cochon had the most amazing looking french onion soup, something the Lonely Planet guide said they were famous for. There was so much cheese on top that you couldn't see the croutons or the soup, just a vast expanse of melted Gruyere that had to be dug through to reach the main event - or was the cheese the main event really? Alas we were just squeezing in a late lunch of grilled pig's trotter and I had to decline the soup so not to ruin the evening meal a mere few hours ahead. I watched in awe the lucky diners around me though. Since then I've been meaning to recreate the dish at home and last week I managed it. I've not quite got the slab of cheese they had, but I managed near complete coverage. When making french onion soup it's really important you get a lot of colour on your onions, without this you're never going to get the deep, rich brown finished article. You don't want to burn them, adding bitter burnt caramels to the flavour, but you want them brown all over and starting to collapse to a sweet, sticky mess in the bottom of the saucepan, a bottom with a yet more onion near (but not quite) burnt on, ready to be loosened with boiling stock. If you manage this you're left with depth of flavour, the caramelised onion permeating everything, and not just onions boiled in beef stock. With the masses of cheese and bread it is a meal in its own right. This recipe is of my own invention, but then it's not the hardest thing to create a recipe for. The Worcestershire sauce may have some French chefs turning in their graves, but it adds a fine savoury element so I'm happy to use it. I'm pretty useless at planning ahead when it comes to food. I like to do a bigger shop on Sundays but mainly to take the car and pick up bottles of carbonated water and other liquid items that aren't too bus friendly. When it comes to planning food ahead though I try not to bother. I spend a lot of time each day thinking what to eat and it will change frequently over the course of the day, let alone between a big shop at the weekend and a Thursday evening. I know what I want and I want it now, but will probably want something different in two hours time. Luckily for me, well i look at it that way anyway, I have to walk past a Sainsbury between my office and the tube station so I can plan what I want to eat during the day then pop in and get the ingredients quickly on the way home. Earlier this week I was thinking what to eat so was having a little run through of what was in the fridge that needed using up: some salad leaves, some tomatoes, some sugar snap peas and a couple of eggs I'd hardboiled on Saturday because it was their use by date. 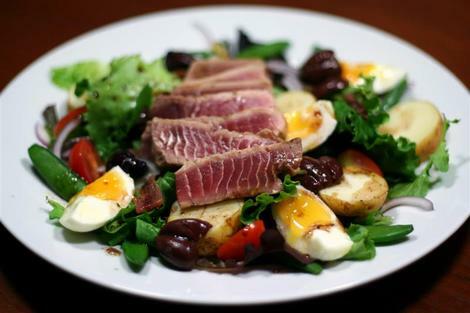 It may call for green beans normally but the first thing that sprang to mind was the old faithful salade nicoise, just changing the beans for sugar snaps and slapping a lump of seared tuna on top. I knew I had anchovies at home too so all I needed was some new potatoes and a lump of tuna and maybe some bread to bulk it up a bit. My heart was now set on this so I popped into Sainos, found loose new potatoes complete with dirt, some mini plum tomatoes (the big tomatoes can get used another day), a still warm baguette and then, aargh, no tuna. I took the gamble that Marks and Spencer (oh, yeah, there's one of those in the tube station too) would have some and bought the rest. Alas when I got to M&S all they had was a single pack of tuna steaks left which looked a bit white-bits-between-the-layers heavy - we'd gone too far to pull out now though so I cracked on.